Brioche is nothing if not rich. 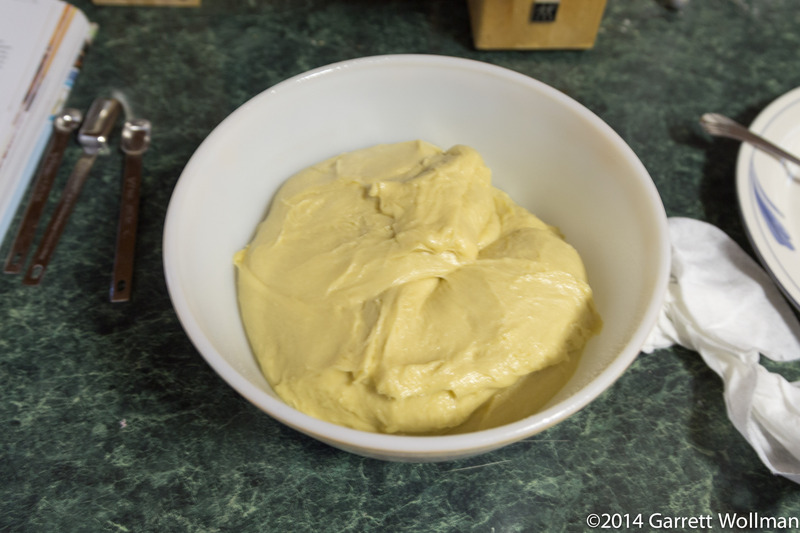 This particular brioche is made with five eggs (plus one more for the egg wash) and twenty-two tablespoons of butter. 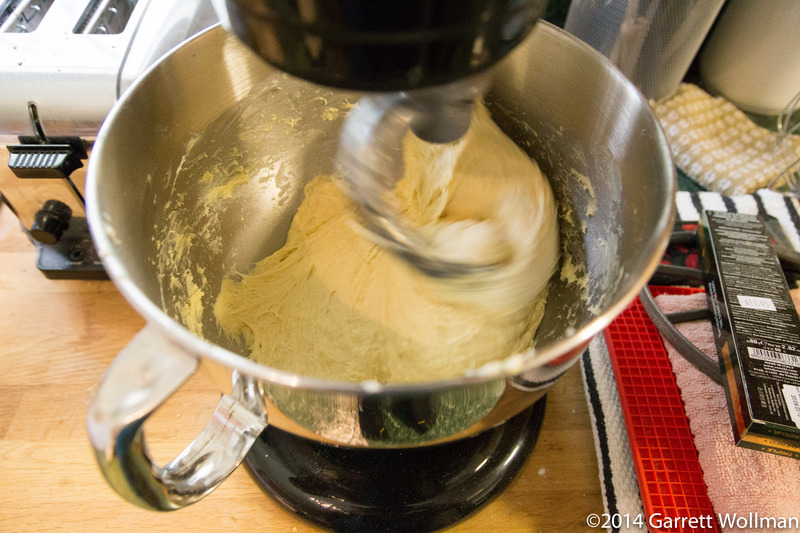 At the beginning of the process, the brioche dough looks rather shaggy and gives the impression that it will never come together. 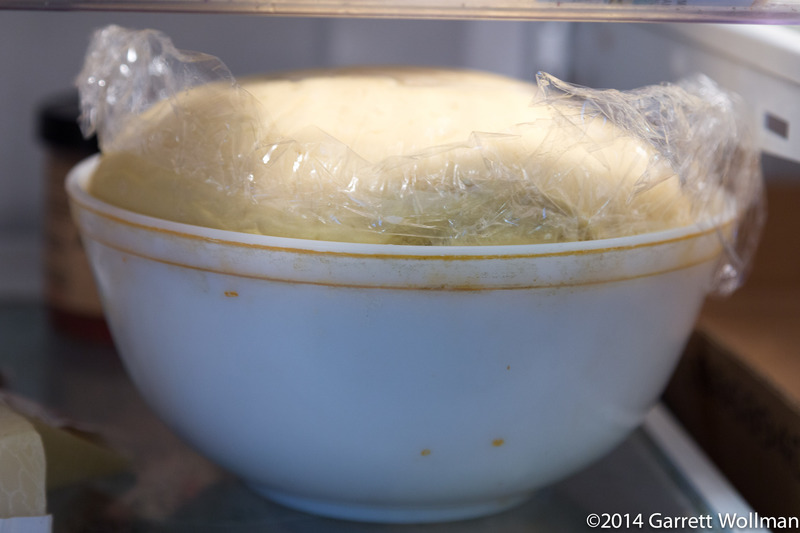 After kneading and any necessary moisture adjustments, the brioche dough is ready for its first proofing — in the refrigerator for six hours. 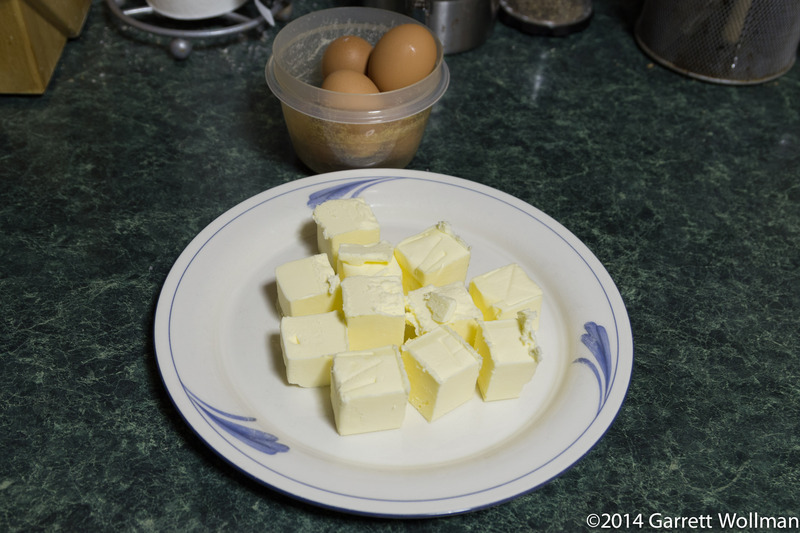 Overnight would be even better, but I needed to finish this recipe in a single day. 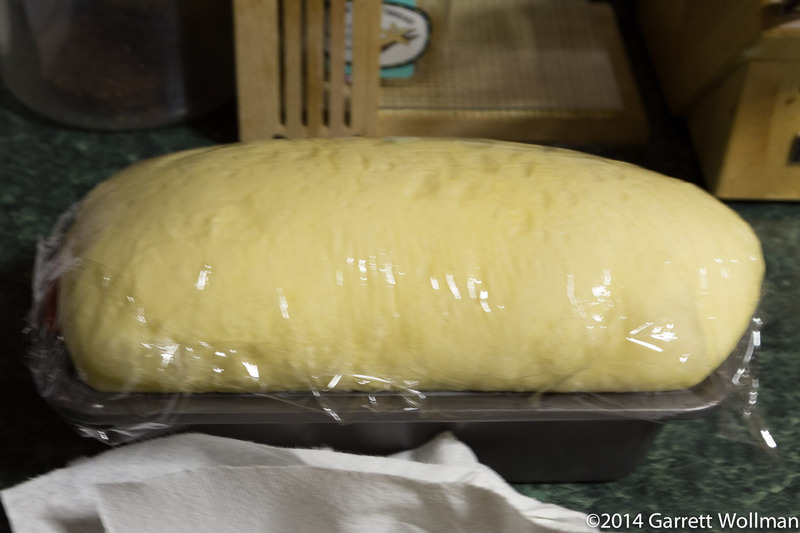 Surprisingly, the brioche dough expands substantially in volume after just six hours, even in the refrigerator. This can probably be attributed to the amount of both yeast and sugar that went in at the start. 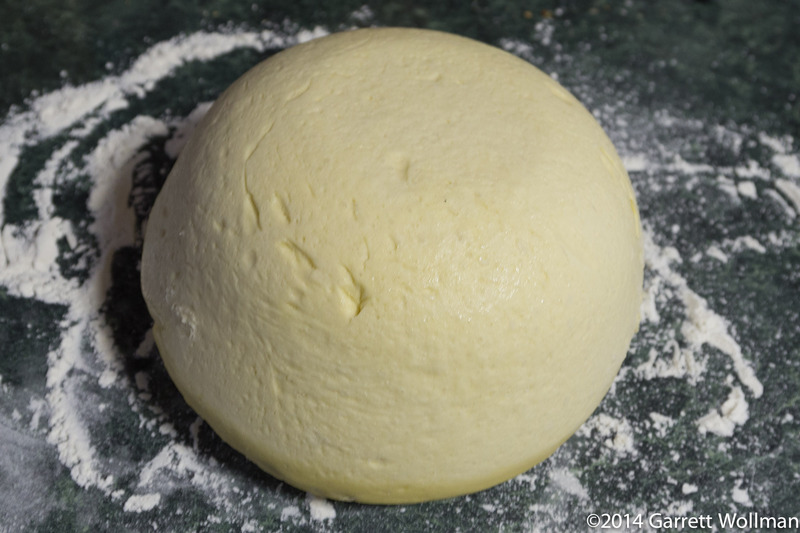 Chang’s brioche recipe makes enough dough for two loaves, so this giant ball of dough needs to be split in half for forming. 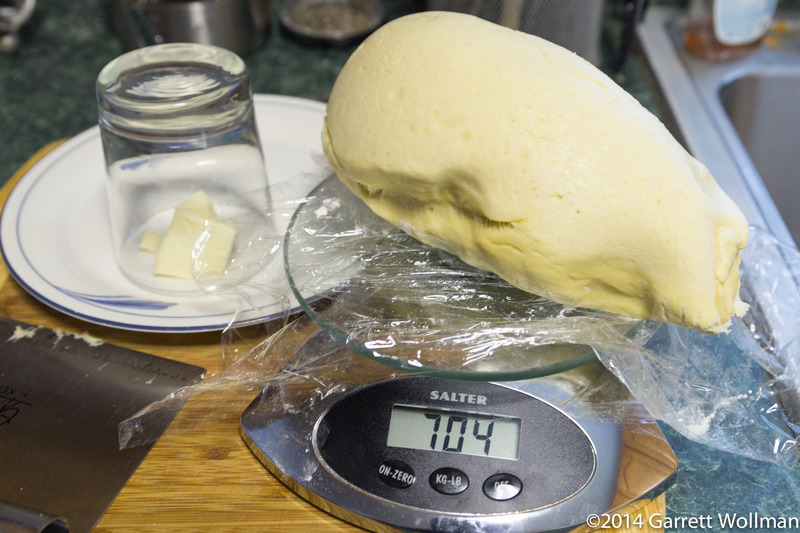 The whole dough ball weighs about 1.4 kg (3 lb). Always best to measure things. 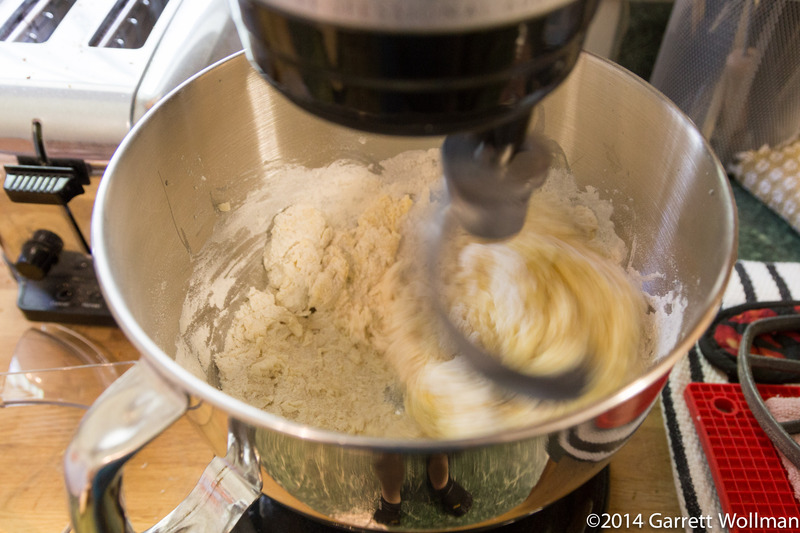 This half of the dough ball will go in the freezer for storage. 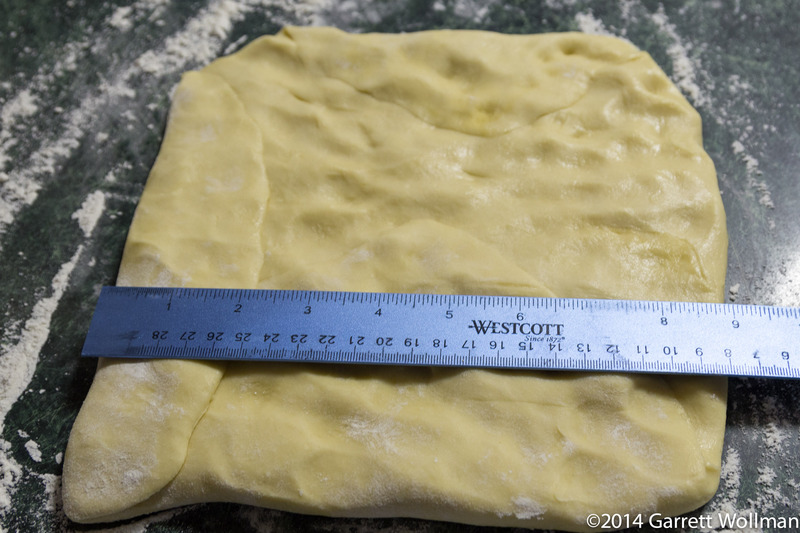 After shaping, the brioche is bench-proofed for another four hours. 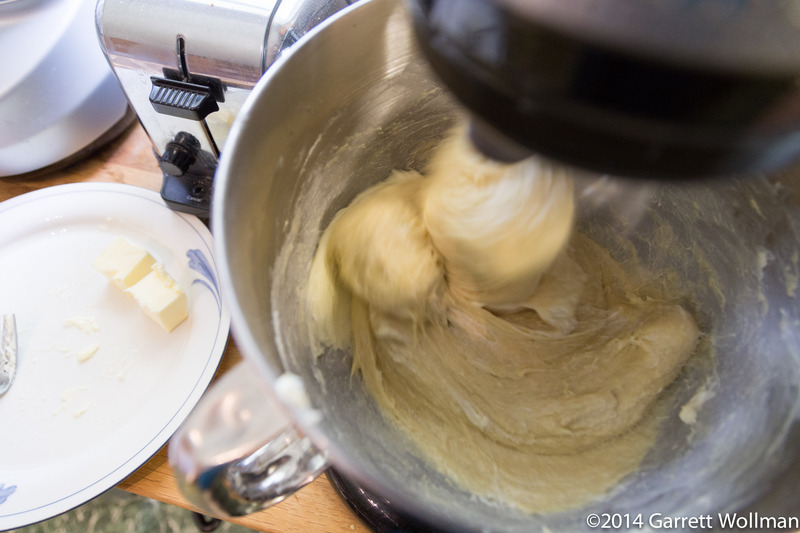 The pan is lubricated with more butter (it was easier than cutting parchment to fit). 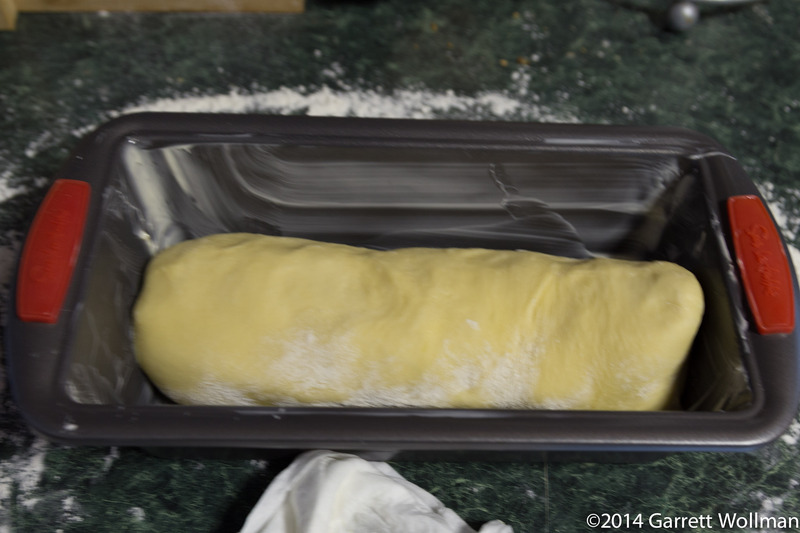 The top of the brioche is brushed with egg wash before baking in a 350°F oven. It was done in only 35 minutes. 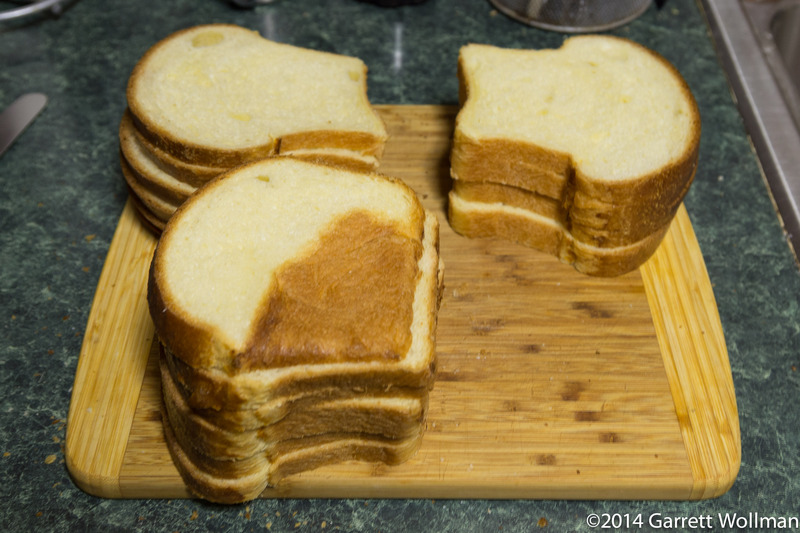 Unfortunately, any unpreserved bread will last about three days in my kitchen before growing mold, so I have to freeze it, and that implies slicing it (so I can thaw individual servings). Even more unfortunately, I can’t slice worth beans, even with the help of my wooden slicing guide, so I have a bunch of really oddly-shaped slices — many of them too thin even for sandwiches, never mind pain perdu. 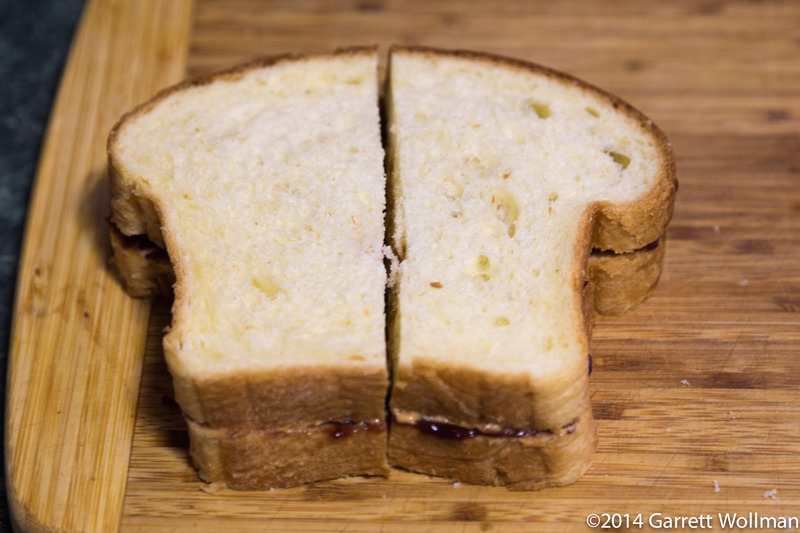 A single loaf, after baking, weighs about 530 g, and makes twelve ¾″ slices — 40–45 g each, or about an ounce and a half. I obviously got more than twelve slices, because I was (believe it or not) trying to make thinner slices, but I don’t think this was a success — for a bread this soft and rich, much better to pay the price and stick with the thicker slices. 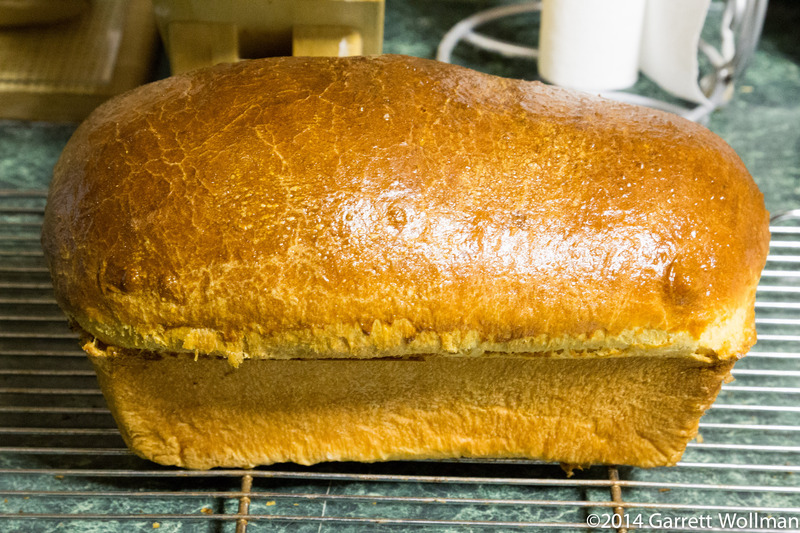 This entry was posted in Food and tagged bread, brioche, Joanne Chang, recipe. Bookmark the permalink. Yum! 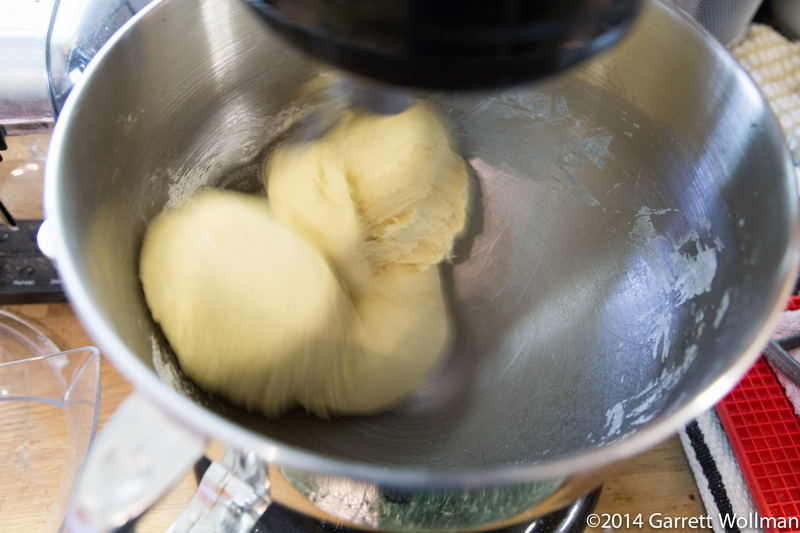 Amazing how the large dough that feels like play-doh ends up being light as a feather to eat…I seriously love brioche.